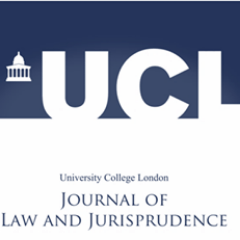 The UCL Journal of Law and Jurisprudence is a law journal run by postgraduate students of the UCL Faculty of Laws. The Journal appears twice a year and is available open access. All submissions are assessed through double blind peer review. The Editorial Board is pleased to call for submissions for the second issue of 2016. This will be our ‘City Issue’ and the Editorial Board welcomes submissions that engage with this general theme. The topic is broadly conceived and leaves scope for any area of law or jurisprudence domestic, regional or international) that is deemed to be ‘City’ related. Submissions could be theoretical, doctrinal or aimed at practice. We accept articles of 8,000-12,000 words, case notes of 6,000-8,000 words and book reviews of 1,000-2,000 words. All submissions must comply with the Oxford University Standard for Citation of Legal Authorities (OSCOLA). Contributions that have already been published or that are under consideration for publication in other journals will not be considered. Please see our Guidlines. The deadline for submissions is 30th April 2015. Manuscripts must be uploaded via the submissions section.